thus Do you need in Apostille? It doesn’t matter if you are located in our service area, Montana, North Dakota or Wyoming. We can help you regardless of your location get an Apostille for any state or the federal government. Moreover, we often combine this service with our translation services, which are part of the miscellaneous services that we offer. Further, you do not have to be a client of Immigration Law of Montana, P.C. in order for us to help you. 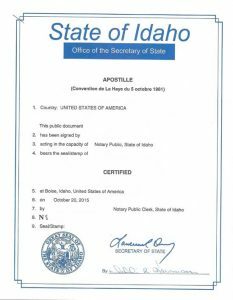 We will authenticate your document for you through the Apostille certification. If you know that you need help, please contact us. Otherwise, please keep reading for information on Apostilles. Apostilles come from the Hague Convention of 1961. Signatories to the Hague Convention thus agreed on a form of authentication that each country will accept. These universal standards about authentication certainly make the authentication process simple. Therefore, someone can easily have a document from one country recognized in another country. For example, if you are purchasing a piece of property in Ecuador, but are currently living in Idaho, you can have your signed sale agreement authenticated with the state of Idaho. 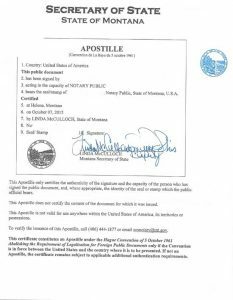 Other examples of documents that you may need authenticated outside of the United States with the Apostille stamp or Apostille certification include corporate documents such as articles of incorporation, company bylaws and powers of attorney. Sometimes your educational documents need authenticated like diplomas, transcripts or letters relating to degrees. Further, many times you have to authenticate family status. Examples include marriage certificates, divorce decrees and adoption papers. A very common request is for an Apostille birth certificate. The last example we see are people who need personal documents authenticated like letters of reference, or job certifications. If you are dealing with a country that is a signatory to the Hague Convention, you can check here, and you need an Apostille, your document authenticated, we can help you. If you are not comfortable with bureaucracy, and don’t know how to get the necessary authentication for your document we can get it for you. We have a lot of experience dealing with each state and the federal government to get the necessary stamp that authenticates the document. If you need to present a document in a Hague Convention country, you will need to attach an Apostille to that document to authenticate it. We can get the appropriate authority to authenticate it. Please contact us with the document that you need authenticated for a quote.